I am not referring to the common phrase “skeleton’s in your closet” which metaphorically points to those little secrets that apparently we all have, where those metaphoric hidden bones come flying out the closet and bust us in our heads. Nor am I speaking of the cleaning out of your closet, referencing getting rid of unhealthy energy suckers that most of us have endured in our lives. 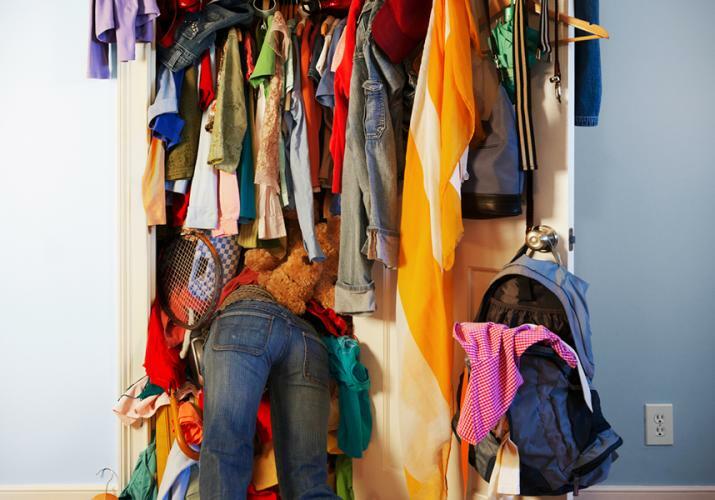 I am simply stating…literally clean out that tangible closet that is likely attached to your bedroom, stuffed so full of clothes a medium sized child could become lost for hours! If your closet is anything like mine, you would be mortified for somebody to open that ominous door. Clothes, boots, hats, belts, shoes, shoes, shoes that haven’t been worn for YEARS, glaring hatefully at you each morning. Judge, judge, judge is what they do! Those old clothes judge you because they are lonely, just hanging there by their other angry neglected woven friends. Judging you, because they realize you are in denial about the fact that you may never be able to fit into them again! And when we purchase something new, we simply punish the size 2 jeans by squishing them even closer to the corner than they were. Before you know it, you’ve have created absolute chaos and unnecessary stress for yourself before finishing your first cup of coffee every single day. Our homes are the one place we get to be the boss. It can be as peaceful and organized or as stressful and overwhelming as we choose. To many, this might seem a silly perspective considering how many significant issues can occur in the course of a day. Which is my point exactly: why start your day being judged by your clothing? We have many reasons to convince ourselves to hang on tight to everything; I’ll fit back into that some day! Everything eventually comes back in style, doesn’t it! I recently read that most people wear 20% of everything they own. If 80% of what is taking up space is not being used, this makes no sense. Right? Believe me when I tell you it is crucial to clean out your closet of people who are takers and I find that maturity helps guide us to those choices. But trying to shake yourself from a draining human being is a whole heck of a lot more complicated that this simple thing that I am proposing. Repair that relationship and reduce your stress.! It can all start with a nice glass of vino, some kickin’ tunes and a huge box of garbage bags. And off you go. Of course it will feel daunting at first, but once the process is underway, (and the wine kicks in), it becomes quite easy. Until it actually starts feeling amazing!